Sportspower Rosemead Metal Swing and Slide Set Only $169.16 SHIPPED (Reg. $299.99)! 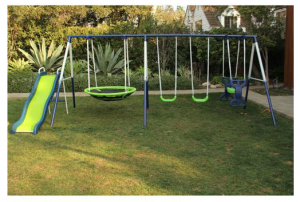 You are here: Home / Great Deals / Sportspower Rosemead Metal Swing and Slide Set Only $169.16 SHIPPED (Reg. $299.99)! If you’ve been looking for a great deal on a swing set for your little ones, check out this Sportspower Rosemead Metal Swing and Slide Set for only $169.16 (Reg. $299.99) SHIPPED!